The ensuite has a thermostatically-controlled radiator and an electric towel rail; the switch is on the outside wall of the shower room. In the interests of the environment, please switch off the towel rail when not needed. In very cold weather please ask for the fan heater. This room has a centrally-heated radiator and a thermostatically-controlled electric radiator. In the interests of the environment, please switch off the electric radiator when not needed. 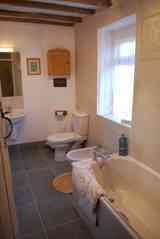 A newly-fitted suite includes bath with power-shower over, bidet, toilet and sink with over-head light and shaving point. Please ask for the under-floor heating to be switched on as required. All prices are per person and include a full English Breakfast, Tea or Coffee on arrival in the residents' lounge or on the patio. 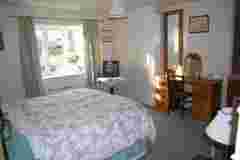 Each room has colour TV., tea / coffee - making facilities, hair dryer. (Switch, Amex, Delta, Maestro, etc.). A small charge is added for balances paid by card. 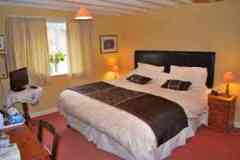 Both letting rooms have colour TV, drinks tray with various teas, coffee and drinking chocolate. Fresh milk is provided as are hair-dryers, cotton-wool and tissues, as well as a sewing kit! Bathrobes are provided for both rooms. Blankets and hot-water-bottles are kept in wardrobes. If staying 3+ nights your bedding will be changed after the second night unless you wish to help the environment. Place towels needing replacement in the shower. An ironing board, iron, extra milk are available on request. Special diets are catered for if notified in advance.